I'm teaching a Valentines Day cooking class next week and I've been excited to share with them the Chocolate (Maple Syrup) Cupcake recipe that I posted last week (link below)! However I've needed to change tactics a bit since 3 people planning to attend told me on Tuesday that they cannot eat gluten. One of these attendees is a new patient and new to plant-based eating and I really want her to come and learn some new and exciting recipes (to treat as treats). Since it is a Valentines Day treat meal, I had decided that using more processed flour then usually, for this occasion, was ok (usually I like to teach them recipes using whole ingredients instead). The rise of the gluten-free fad has been frustrating to me. People are using it as a diet to try to lose weight by omitting gluten (the healthy plant protein in wheat) and replacing it with refined products made out of potato starch (with zero fiber and highly refined)! By removing gluten you automatically remove crackers, pizza, and doughnuts, which is a good thing, but by replacing those things with the fiber-lacking gluten-free alternatives (instead of whole grains like quinoa and oatmeal) I believe you will be worse off. Fiber is so important! When it comes to gluten I am promoting less processed foods like using wheat berries (use them like rice), Ezekiel 4:9 bread (sprouted whole grain bread made with no flour), or seitan (this is made with very little preservatives or flavorings and can be eaten like a meat substitute). I agree that you should limiting anything refined (especially flour); however, over time I've started to relinquish, albeit begrudgingly, my stance on gluten-free diets as wheat (in this country specifically) is not grown in the same manner that it used to be and the rise in legitimate gluten sensitivities is alarming! Not all wheat is created equal anymore. Thus was born these cupcakes. Once again, this is a treat and should never be staple. When it comes to holidays it is best to find a healthier alternative to the things you will want to eat anyways. Happy (almost) Valentines Day! OH! AND! Why beets? Because they add moisture (like apple sauce) and fiber and make everything pink! Chop the stems off 1-2 beets and scrub them clean. Place the beets in a large saucepan and add water to cover. Bring to a boil, reduce heat, and simmer until tender (about 45 minutes to 1 hour). Once cooled, peel the beets by pushing the skins off with your fingers or a butter knife. The peel should slide off easily. Cut the beets into chunks and, using a food processor or high powered blender, blend or process into a purée. You may need to scrape down the sides occasionally or add 1-2 tablespoons of water. 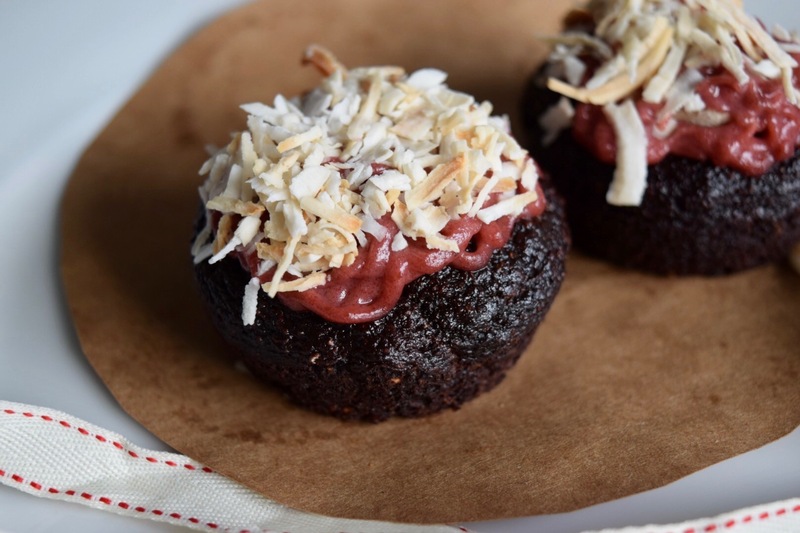 You will need 1/2 cup of beet purée for this recipe. (TIP if you know you will get about 1/2 cup purée from your boiled beets you can add the maple syrup and lemon juice to make blending easier-if you will have too much beet purée then you don’t want to add the maple syrup just yet). You want to save the extra purée as you will need this to color your frosting pink. Lightly grease a cupcake pan (enough to make 12 cupcakes). Using a blender, food processor, or coffee grinder, blend rolled oats into oat flour. Empty oat flour into a bowl and do the same with the almonds. Add salt, baking soda, and baking power and mix to combine. In another bowl mix 1/2 cup beet purée, 1/2 cup maple syrup, and vanilla extract. Combine dry ingredients (oat mixture) to wet ingredients (beet mixture). Divide the batter between the cupcake slots in your cupcake pan. Bake for 30-35 minutes until a toothpick inserted in the center comes out with fudgy crumbs. Make frosting of choice (from links above or from the recipe below), frost cupcakes, and enjoy! Soak cashews for 4+ hours (or soak 2+ cups at a time and store in the freezer- this is what I do). Drain cashews and combine with milk in a high powered blender and blend until silky smooth. Use leftover beet purée (from cupcake recipe) and strain all of the pink juice out of it (2-3 tablespoons worth) or you can blend up a small amount of puree into the frosting. Not too much or you’ll be able to taste the beets. Remove the pits from the dates and add them to the blender. Add lemon juice and beet juice (if using for pink color) and blend until smooth. Scrap down sides as necessary with a spatula. Place frosting in the refrigerator or freezer for 20 minutes to cool and firm up. Now you are ready to frost your cupcakes. Store leftover frosting in freezer. Thank you for some other great article. The place else may just anyone get that kind of info in such a perfect approach of writing? I have a presentation next week, and I am at the search for such info. Thanks a bunch for sharing this with all folks you actually realize what you are speaking about! Bookmarked. Please additionally talk over with my site =). We could have a hyperlink alternate contract between us! you’re in reality a just right webmaster. The site loading speed is amazing. It sort of feels that you’re doing any unique trick. Also, The contents are masterwork. you have performed a great process in this subject! I am no longer sure where you are getting your information, but great topic. I needs to spend a while learning much more or working out more. Thank you for magnificent information I used to be looking for this information for my mission.